You don’t need a blizzard outside to appreciate how weatherstripping can help prevent freezing drafts from entering the house. Just listen to the difference between slamming an interior door and an exterior door. The exterior door is heavier and thicker, so it should make a lot more noise. But it doesn’t. That’s because the exterior door has weatherstripping to cushion the impact of the door against the stop molding, muting the slam. An interior door sounds a lot louder when it slams, because there’s no weatherstripping. Exterior doors are typically sold and installed as prehung units. A prehung exterior door comes already hinged to a frame made up of jambs, a sill or threshold, and flexible foam weatherstripping. The weatherstripping installed along the bottom of the door is usually referred to as a door sweep. The foam weatherstripping around the side and top jambs is designed to compress between the door edge and a stop molding when the door is closed. 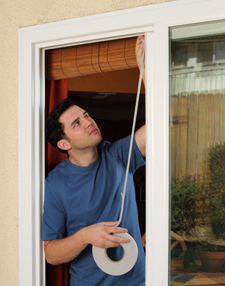 Modern door weatherstripping works effectively at sealing air leaks, as long as it’s in good condition. But because an exterior door gets such heavy use, weatherstripping will eventually wear out and need to be replaced. That’s why it’s worth inspecting your weatherstripping. Look for telltale gaps (visiable air spaces) around the edges of the door. Take a close look to make sure the door sweep is sealed against the threshold when the door is closed. Sometimes a door’s original weatherstripping falls out and is replaced with self-adhering foam strip weatherstripping that doesn’t seal effectively. If you’re uncertain about how well your weatherstripping is working, contact an experienced home energy specialist. Like doors, windows have built-in weatherstripping too. On the sides of a modern double-hung window, the weatherstripping is usually integrated into the plastic spring-actuated “jamb liners” that put pressure on the window sash frames as they move up and down. The bottom and top of the window sash will have compressible bulb or foam weatherstipping. These materials are designed to last the life of the window; only the top and bottom weatherstripping pieces can be replaced. If there are cold winter drafts around the edges of a modern window, it’s likely that these air leaks aren’t coming from the window itself, but from an open, unsealed "shim space" between the window jambs and the wall framing. Contact a home energy technician about correcting this problem. This specialist may suggest removing the window casing to make the empty shim space accessible so that it can be sealed and insulated with low-expansion spray foam. If your house has historic, single-pane windows that rely on a rope and sash weight system to move up and down, you can be sure that there are air leakage problems in the window itself and around it as well. While it’s possible for a skilled carpenter to limit this leakage by dismantling the window and installing “leaf-style” vinyl weatherstripping, you may want to consider installing modern replacement windows that will do a much better job of cutting down on drafts and energy losses. It’s important to keep in mind that weatherstripping is just one part of an overall air-sealing strategy that is supposed to keep the “conditioned” air where it belongs: inside your living space. 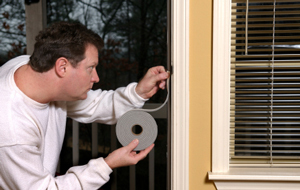 Most houses have way too many air leaks --gaps, cracks and openings that have the cumulative effect of leaving a window open all day, every day. As a result, air that you paid to condition (heat or cool) leaks out in certain areas of the house (exfiltration), while outside air leaks in at other locations (infiltration). Having your house professionally air-sealed will put an end to unwanted exfiltration and infiltration –the air leaks that compromise interior comfort while adding to your utility costs. Our contractors services the Connecticut, Hartford, Bridgeport, Norwalk, Waterbury, Stamford, New Britain, West Hartford, Bristol, Danbury areas as well as surrounding Connecticut towns. Call 1-888-370-6924 or contact us online to schedule a Free Estimate.